Compiled by Arkapologist Norman Geisler, Ph. D.
Mt. Ararat is the only spot on the earth’s surface that matches the biblical description (Gen. 8:3) of the landing place of Noah’s Ark. A large wooden structure about the size of Noah’s Ark (Gen. 6:14-16) lies broken in 3 sections above 14,000 feet on Mount Ararat. Scattered wreckage indicates that the structure has slid from the top of the mountain along the glacier extending from the south side of the mountain. The top of the mountain is permanently frozen which are excellent conditions for preserving organic artifacts from more than 4000 years ago. Natives whose ancestors lived on and near Mount Ararat report that the structure slid from the saddle of the mountain in the great 1840 earthquake. Wood from the structure carbon dates to about 2800 BC, fitting the biblical era of Noah’s Flood according to chronology in Genesis 5. Pottery found in the structure dates to the Early Bronze Age which fits the biblical date for Noah’s Flood (Gen. 6-9). One section shows nautical features, such as a bowed hull. Ship construction techniques match Early Bronze Age (time of the Flood). Three levels of the structure are visible which fits the biblical data (Gen. 6:16). It is constructed with square wooden pegs inserted into hewn square holes. Fallen boards inside the structure are suitable for cage material. Strong odor rises from lower deck where animal dung would have been. Hull is covered with a dark substance like the pitch on the Ark (Gen. 6:14). Natives of the mountain and surrounding areas have apparently always believed this to be Noah’s Ark and report many visits to the site. Artifacts found in site indicate visits over many centuries from before Christ. It contains compartments with ceiling beams of 7 wooden pegs, possibly for tying or feeding clean animals. I have personally interviewed 5 eyewitnesses who have been in the structure—all of whom are convinced that it is Noah’s Ark (see photos at http://christianleadersandscholars.com/araratwp/video-and-photographic-evidence/ See the books by Philip Williams, The Archaeological Evidence of Noah’s Flood (Charlotte, NC: Christian Leaders & Scholars Press, 2011). 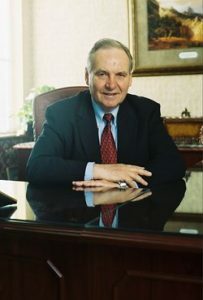 Norman Geisler is a Christian systematic theologian, philosopher, and apologist. He is the co-founder of two non-denominational Evangelical seminaries (Veritas Evangelical Seminary and Southern Evangelical Seminary.) He holds a Ph.D. in philosophy from Loyola University and is well known for his scholarly contributions to the subjects of classical Christian apologetics, systematic theology, the history of philosophy, philosophy of religion, the creationism and evolution debate, Calvinism, Roman Catholicism, biblical inerrancy, Bible difficulties, ethics, and more. He is the author, coauthor, or editor of over 90 books and hundreds of articles.